Waiting has never been easy for me. Everything that I have waited for had an "ending." Waiting to finish my degree. Waiting to deliver my children. Those waiting times were hard. But I had things to do. I prepared while I waited. While we wait for this fourth child, although I have things to prepare for at times, most of my time, I have nothing to do. There is no use trying to figure out what kind of medical specialist she will need. I have no idea what size clothes she will wear. I do not know whether I can plan certain things because we have no idea when we will be traveling. It could be six months from now. It could be a year from now. It is hard to make any long-term plans. I was recently encouraged by a post from the Femina Girls website. Waiting is action. It is an expecting. A sitting still and looking forward. Waiting involves an expectant end and a fulfilled hope. Although I have done a lot of waiting so far (six months), I have a lot of waiting to come. Although I have a lot to learn about waiting, I wanted to share with you what else I've learned so far during this waiting period. So much of this situation is out of our hands. We can plan, prepare, and evaluate - but God is in control. I have had to let go (over and over again) throughout this process. It is good because I am learning to trust God. I am learning that rest and trust go hand-in-hand. I trust that God's character is just the same: He loves, He is faithful, and He is guiding us. I trust that He holds our little daughter (wherever she is) in His hands. He knows her, and I trust that He will bring her to us. Although faith and trust are similar, faith is something I can exercise. Trust is a heart attitude for me. Trusting means that my heart is at peace and I am clinging to God and His hope. Faith is something I do. I have faith in God. I praise Him, even when we have been disappointed and discouraged. I tell others of God's loving care during this waiting time. I am proving by my actions (and reactions) that I have faith in my God. Although pregnancy was a rough emotional experience (especially with all the hormones), nothing has tested my peace than this adoption process. I am so prone to worry. I try to control things because I worry. I think of "worse-case-scenario" and it stills my peace. Peace is a settled calm. God is teaching me that to have peace, I need only to look to Him. My perfectionism steals my peace. I am learning to let go and trust. Peace comes because I know God will keep His promises. I am content knowing that God will continue to work out all the details that need to happen to bring her home to us. We are a generation of people who want INSTANT gratification. Waiting for anything seems too hard. 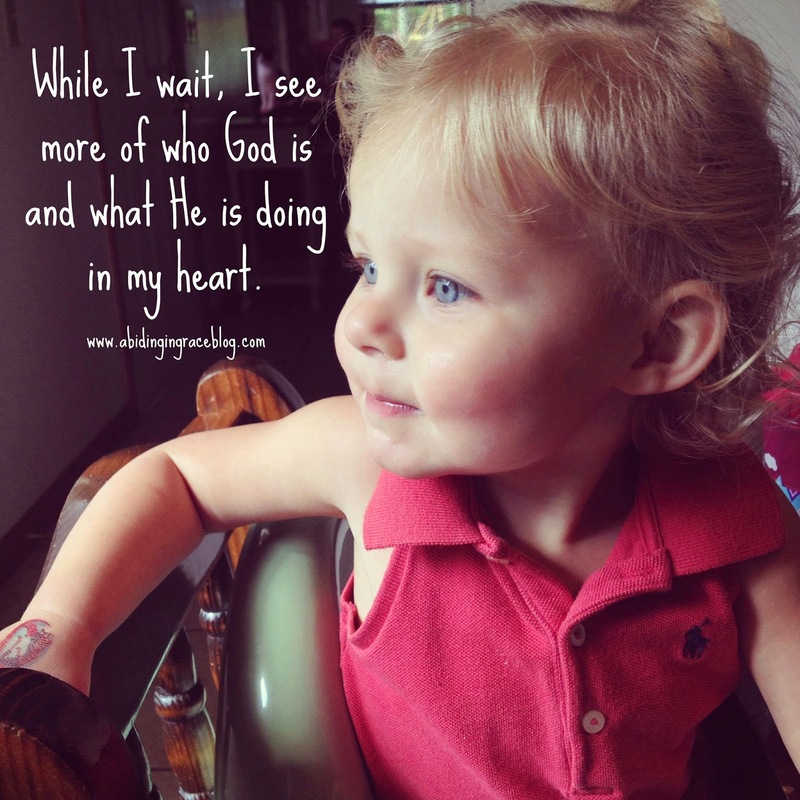 This adoption process has taught me the value of waiting with a good attitude. Patience is about having the right attitude. It is also about having the right actions. The psalmist says "I patiently wait on the Lord." Our attitude and actions do matter when we wait! His faithfulness. When it seemed that the doors were opening, all I could see was God pointing the way. We had (have) so many doubts as to whether we should be doing this, but God keeps reminding us over and over again that He will be faithful - until the end. It gives us joy to know that He is leading us. His sovereignty. So many things were (are) out of our control. We did not know whether to go domestic or international. We did not know what country to chose or what agency. With a lot of prayer and research, we have found the perfect fit. We are so excited to be adopting from China. We have been so pleased with our agency. God knew all that. Because He is all-sovereign, I can rest that He will continue to help us make the "right" decisions. His loving kindness. Because God is so faithful and sovereign, it gives my heart such a sense of humility because in is faithfulness and sovereignty I see His love. He loves our family - out of all the millions of orphans, he loves our little daughter. His love is overwhelming and beautiful! Waiting has shown me that. His justice. The injustice to children in this world is so heart-breaking. Through this process, I've seen that God is at work - among people from all over the world. He is working through them to care for these orphans. He will make things right. If not in my lifetime - then certainly at the end all things will be right. When the Psalmist says "I wait on the Lord" - I always thought he was waiting for God to DO something. I think instead maybe he was waiting for God to show up and reveal Himself. We recieved word that our I-800A was recieved and approved! We are now waiting on the 797 form to come in the mail. That is one of the last pieces of the puzzle before we submit our dossier!! So exciting!! Praying for you as you wait!